It’s summer and we need to eat ice cream. Vanilla isn’t usually my go-to flavor; I like something different, something a little more adventurous. But when making ice cream at home, for a crowd, vanilla is a flavor everybody likes. And, frankly, when vanilla ice cream turns out this well, it should be a go-to flavor. This recipe yields a wonderfully rich and creamy ice cream that packs a strong vanilla punch. It’s not a wallflower vanilla; it can stand on its own. 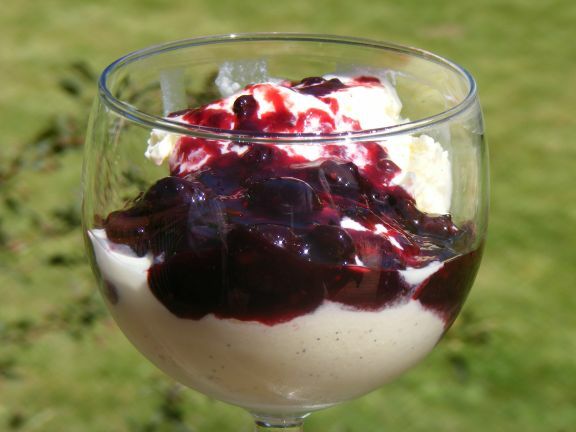 But if you felt like pairing it with other things, like some blueberries and blackberries heated up on the stove with a bit of berry jam, or in a tall, fizzy root beer float, fear not: this vanilla ice cream plays well with others. With a knife, halve vanilla bean lengthwise. Scrape seeds into a large heavy saucepan and stir in extract, cream, milk, and sugar. Bring mixture just to a boil, stirring occasionally, and remove pan from heat. In a large bowl, lightly beat eggs. Add hot cream mixture to eggs in a slow stream, whisking, and pour into pan. Cook custard over moderately low heat, stirring constantly, until a thermometer registers 170-degrees. (This may happen instantaneously; do not let boil.) Pour custard through a sieve into a clean bowl and cool. Chill custard, its surface covered with wax paper, at least 3 hours or until cold, and up to 1 day. Freeze custard in an ice-cream maker according to manufacturer’s instructions, in 2 batches if necessary. Transfer ice cream to an airtight container and put in freezer to harden. Ice cream may be made 1 week ahead.